Jarred tomato sauce for meatballs makes this Empire Baking Company’s Meatball Sliders Recipe quick and easy. Just make the meatballs (or buy them), spoon some sauce, serve on a fresh bun and you’ve got a delicious sandwich. Empire Baking Company hosts a Friday Recipe Share approximately once a month. Gorji sampled his jarred tomato sauce for meatballs during the lunch time recipe share event. Gorji Gourmet Pomodoro Sauce is part of Chef Gorji’s award-winning line of pasta sauces that include Arrabiata Diabolo and Puttanesca. Pomegranate Vinaigrette and Dipping Oil/Marinade Primer complete the line of gourmet sauces. Chef Gorji’s sauces were developed from recipes he cooks with nightly in his kitchen at Canary By Gorji, a fine dining restaurant in Addison (Dallas), TX. • Gorji Gourmet Sauces won Gold, Silver & Bronze at ZestFest 2015, 2016, 2017, 2019 and a Scovie Awards in 2016, 2018, 2018, 2019. They are a family owned bakery and café. Their large selection of breads, pastries, cookies, sandwiches and salads are handmade from scratch daily. They also carry a curated assortment of gourmet and local products including Gorji Gourmet Pomodoro Sauce. 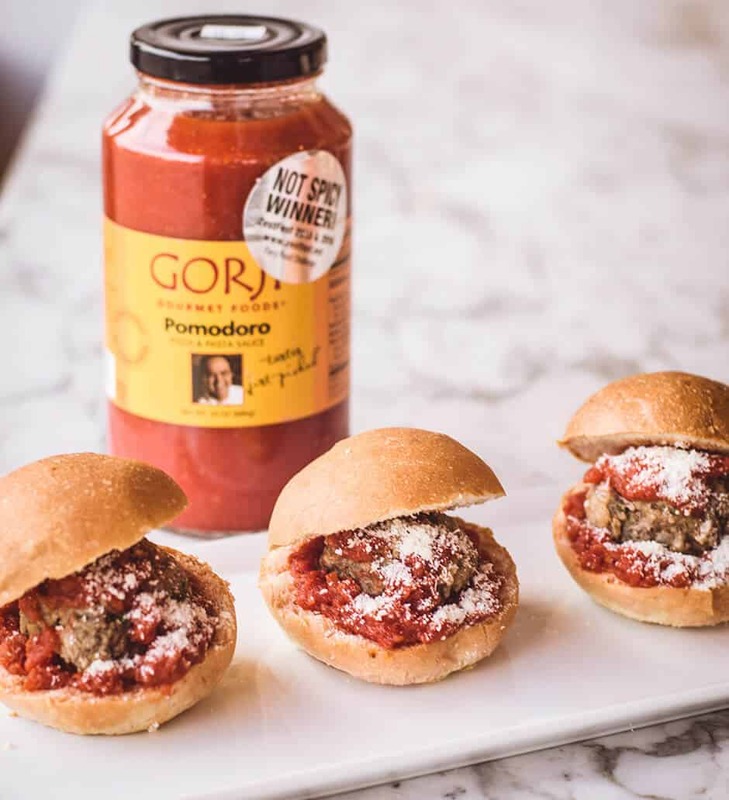 No Replies to "Gorji Pomodoro Sauce | Empire Baking Co | Meatball Sliders"